Many jobs in the future aren’t even in existence today. Recite this oft-repeated statement with a slow, deep, ominous voice to sound as if we’re seriously unprepared for what lies ahead. Maybe we are. However, I would argue this dynamic has been coming true for a long time. Take for instance the start of the personal computer revolution. Microsoft and Apple were both founded in the mid-1970s. Atari was rolling out video game consoles around the same time. Who knew the industries and new jobs these companies would spawn worldwide? I didn’t. In the late 70s, I was in college and missing more computer programming classes than all my other courses combined. And yet, here we are in a world so different from 40 years ago. Let’s go back even further with the help of the 1942 senior class yearbook from Will Rogers High School in Tulsa. All 504 soon-to-be graduates, including my dad, have listed their career aspirations for us to survey. This is a fascinating opportunity to travel back in time and experience the Greatest Generation’s view into the future. A very different country reveals itself. Not only had we just entered a world war, we needed a large part of our population to build things after many years of suffering through a depression. No one knew what the war or its aftermath would bring, but were these students prescient in seeing the dawn of the computer age – or even the explosion of television? As I checked off each senior’s employment ambitions, it’s no surprise that 68 of the graduates used the word “engineer” in their job goal. In fact, engineering was the most popular occupational category for the class of ‘42. Another 25 mentioned architecture or design. Numerous others included some type of construction occupation. Clearly, this was the age of building and rebuilding. A total of 47 wanted a career in aviation in some way – building, flying, fixing or “hostessing.” In hindsight, commercial aviation was still in its infancy. But by one count, 216 airlines had been started worldwide by 1942 so it wasn’t brand new either. Another 11 seniors used the word “radio” in their job description, a technology that was also well established as it had been commercialized since the early 1920s. What about the newer technology of television? No one listed it in any way, shape, or form, even though television existed in select markets prior to the start of the war. It was probably too early to expect anyone to list computers as a career goal… and no one did. The first computers, as we think of them today, were still under development, although more primitive versions had existed for years. Yet, there our parents and grandparents were. They would soon be creating the age of computers and launching us into the space age. They would be transforming how we viewed the world and ourselves with the rapid commercialization of television and global communication. These industries and numerous others needed to fill jobs that didn’t exist or barely existed a few short years earlier. There are probably many lessons to be learned from a look back to 1942. One conclusion: it has been common for many jobs of the future to not exist in the present, nor be anticipated. (Related and perhaps surprising - virtually all of the careers listed in ’42 still exist today, even if only a handful of jobs for some.) Maybe due to the speed of change today, our reality is different, and we really will be sorry for our inability to be totally “prepared.” I’m betting not, though. Change and adapting to it does create friction in society, but we’ve proven that we’re up to the task. More people should work for their dinner instead of dressing for it. What about the dreams of the other ’42 grads? Thirty-five wanted to go into medicine. By contrast, only 20 put down accounting as their career goal. And a mere 14 listed lawyer. One solitary senior looked to be a banker. Not a single person wanted to go into investments. The previous 13 years had not been kind to the world of business and finance. The next 13 years (and more) would be. Eighteen students recorded stenographer as their future occupation. Fortunately for them, email would not be available for decades. Here are the careers I found most interesting: Western Union, Ice Follies, radio continuity (an announcer between radio programs), costume designer, traveling salesman, and joining the R.A.F. (British Royal Air Force). Finally, an observation that perhaps challenges the stereotypes we might have regarding this generation - only four women out of 249 listed “housewife” as their desired future. By comparison, three recorded “aviatrix” as theirs. I wish I could go back in time and talk to these young people. What a difference a month makes. Combine a few positive comments regarding the trade dispute with China, throw in a dash of "not bad" economic news, mix in the Fed signaling a more dovish (investor friendly) monetary policy and voilà - you have the strongest January for stocks since 1987. 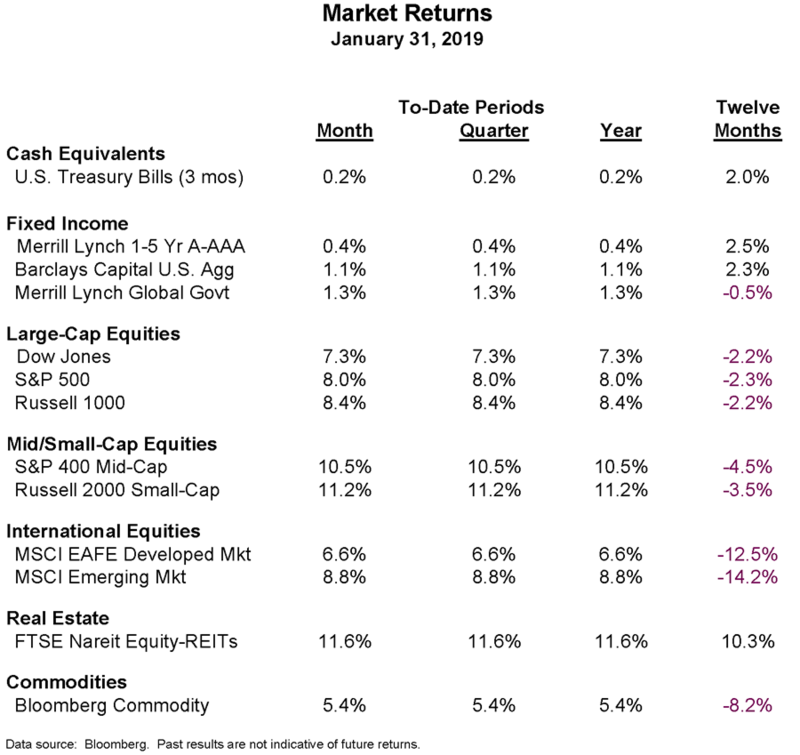 Fixed income investments also had a solid positive month, a welcome occurrence.